Well, she only flew the Millennium Falcon! After a stella (pardon the pun!) end to 2015 with the launch of Star Wars’ new movie the obligatory board games have been flowing out even since. But the one that’s ended up getting it’s own hashtag, for the wrong reasons I may add, is the Monopoly Game for Star Wars made by board game legends Hasbro. Buy why? So not a major character then? Seriously. However, Hasbro has today confirmed that it would be adding Rey to its Star Wars Monopoly set following extensive fan criticism. 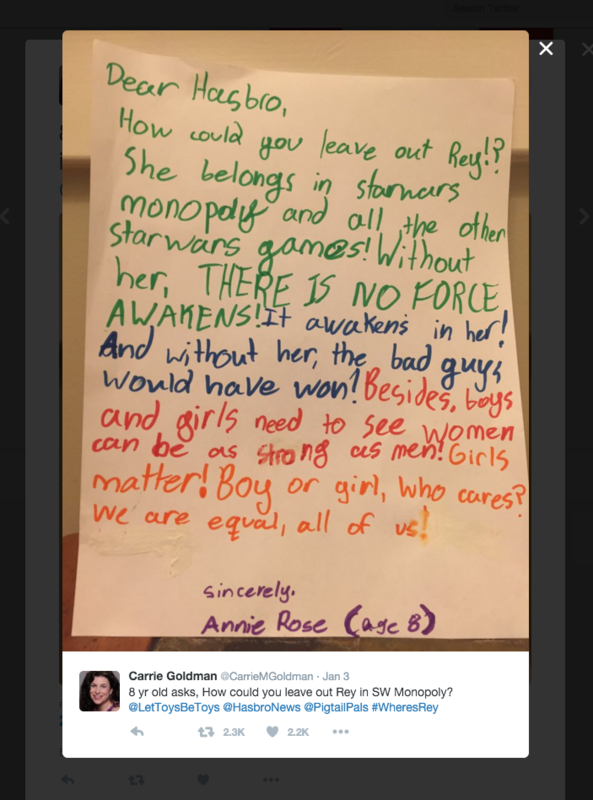 The hashtag “#WheresRey” trended for several days as fans complained about the omission of the female lead. Nope, not Yoda (sorry pal, next time) but it’s a super-powerful 8 year old called Annie Rose. We’re in the Birmingham Post!